Herdim Small Sharp Teardrop Nylon Guitar Pick. Dimple raised pattern in the center of the pick keeps the pick in your fingers! Crafted in Germany since 1960. Rock on. I'm not sure if I've ever reviewed a pick before, but after trying these out, I just have to talk about them. I tend to like thinner picks, and in recent years have preferred nylon material, but the last few months I have been experimenting with heavier Jazz III style picks. Because these are labeled "small sharp teardrop" I thought these might be a middle ground between the two. However, when I got them in the mail, I had to literally laugh out loud. Herdim might called them small teardrops, but they are comically huge picks. Twice the size of a normal size pick like a Herco Flex 50 and probably 3 times as large as a Jazz III. I've never seen anything like it before. The regular blue (non-sharp) Herdim teardrops are about the size of a regular pick with an elongated point, but these red sharp teardrops are absolutely gigantic. I tried playing with them but found to be pretty cumbersome for anything other than casual strumming on an acoustic. If you have Andre the Giant-sized hands and are in need of a bigger pick, the heavens have answered your prayers, and these Herdims are that answer. However, if you're a regular human being, these will probably be a little bit overkill in size to be truly useful. 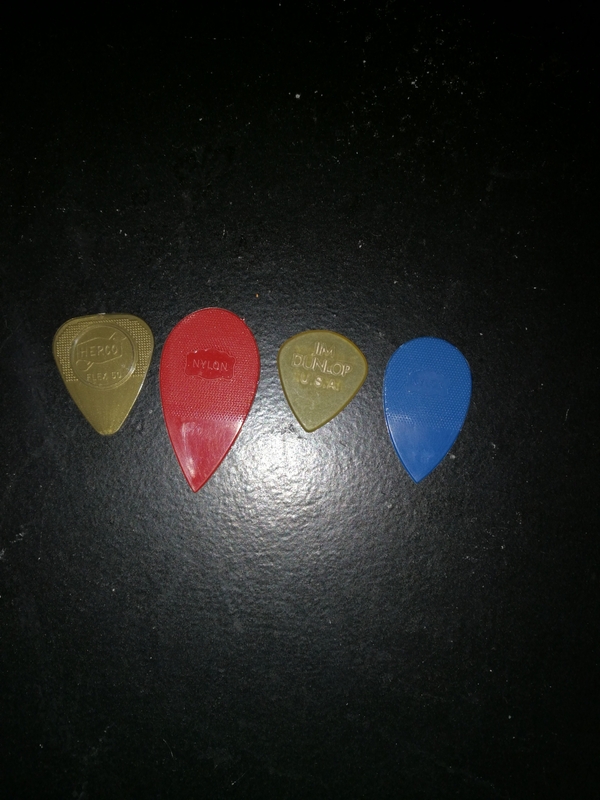 They're a pretty cool novelty pick nonetheless though.